The wait for Norouz is finally over! We have officially left behind winter and entered into spring. I have had a crazy a few weeks and managed to get sick and not rest at the beginning which made me even worst. I am in a crazy catch up mode. I was running so behind that my Haft Seen was not even ready before this morning. As I was putting the final touches on my Haft Seen when my mom called and we spent Saleh Tahvil, the exact time of the new year, on the phone together. I wish all of you who celebrate Norouz a very happy and prosperous new year. I hope that 1393 will be a fantastic year for all. For said occasion I though I’d share this fun Norouz related music video by Hooman & Ramtin! 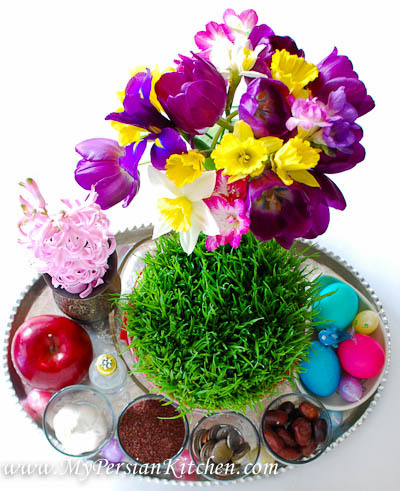 Happy Persian New Year!!! Enjoy your blog & information & recipes so much. Thank you so much for all you do for all of us. Wishing you much happiness joy good health & much prosperity. Edi Shoma Mobarack to you & all your family. Embla, not yet. But I will in the future! thanx for ur great site! I left Iran with zero knowledge about cooking cuz it was always mommy as the backup there 😉 I learned lots of recipes here from ur site. what a bad luck we don’t have any Iranian restaurants near where I live. Thanks for hearing me out and Khuda Hafiz (for now)!